Blessed Nikolai of Pskov for more than three decades assumed the exploit of holy fool. And quite a long while before death he acquired the gifts of grace of the Holy Spirit and was granted the gift of wonderworking and of prophecy. The Pskov people of his time called him Mikula (Mikola, Nikola) Sallos, which in translation from the Greek means "blessed, fool", and even during his lifetime they revered him as a saint, even calling him Mikula the Holy. In February the year 1570, after a devastating campaign with an army of the Oprichniki against Novgorod, tsar Ivan the Terrible moved against Pskov, suspecting treason and preparing it a like fate of Novgorod. As the Pskov chronicler relates, "the tsar was come... with great fierceness, like a roaring lion, as though to tear apart innocent people and to shed much blood". All the city prayed for the averting of the tsar's wrath. Hearing the peal of the bell for matins throughout all of Pskov, the tsar was reading the inscription on the wonderworking Liubyatovsk (at Liubatov stood the tsar's army) Umilenie-Tenderness Icon of the Mother of God (Comm. 19 March). "Be kind of heart, – said he to his soldiers, – lay down the swords upon the stones, and let the killings cease". All the inhabitants of Pskov came out upon the streets, and each family was on their knees at the gate of their house, bearing bread and salt for the meeting of the tsar. On one of the streets Blessed Nikolai ran out towards the tsar, astride a stick as though galloping an horse, and cried out to the tsar: "Ivanushko, Ivanushko, eat the bread-salt, and not Christian blood". The tsar gave orders to catch the holy fool, but he disappeared. Having forbidden the killings, Ivan the Terrible still intended to punish the city. The tsar heard the molieben at the Trinity cathedral, he venerated the relics of holy nobleborn Prince Vsevolod-Gabriel (Comm. 11 February), and he desired to receive the blessing of Blessed Nikolai. When the tsar arrived at the cell of the saint, that one said: "Hush, come in, (wouldst thou have nothing, traveller), to have a drink of water from us, there is no reason thou shouldst shun it". The holy fool offered the tsar for a bite a piece of raw meat. 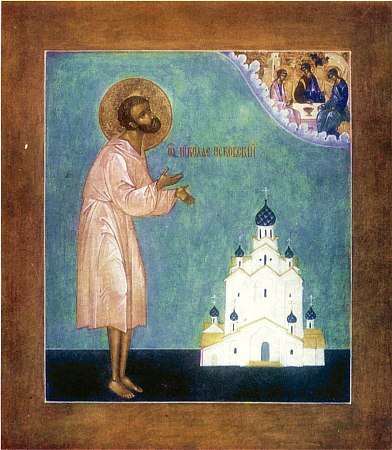 "I be a Christian and do not eat meat during Lent", – said Ivan to him. "Thou drinkest human blood", – the saint answered him, instructing the tsar "by many terrible sayings", that he should cease the killings and not plunder the holy churches of God. But Ivan did not heed him and gave orders to take the bell from the Trinity cathedral, and then, in accord with the prophecy of the saint, the finest horse of the tsar collapsed. The prayer and the lecture of the saint awakened the conscience of the tsar. Frightened by the coming to pass of the prophecy and denounced in his wicked deeds, Ivan the Terrible ordered a stop to the plunder and fled from the city. The Oprichniki, witnessing this, wrote: "The mighty tyrant... departed beaten and shamed, driven off as though by an enemy. Thus did a worthless beggar terrify and drive off the tsar with his multitude of a thousand soldiers". Blessed Nikolai died on 28 February 1576 and was buried in the Trinity cathedral of the city saved by him. Such honours were granted only to the Pskov princes, and later on, archpastors. The local veneration of the saint began all of 5 years after his death. In the year 1581, during a siege of Pskov by the soldiers of the Polish king Stefan Bathory, to the blacksmith Dorofei appeared the Mother of God together with a gathering of Pskov saints praying for the city, among whom also was Blessed Nikolai (the account about the Pskovo-Pokrovsk Icon of the Mother of God is located under 1 October). And still now also at the Trinity cathedral do they venerate the relics of Blessed Nikolai of Pskov, who "of the flesh of folly wast, ... being manifest a citizen of Mount Jerusalem, ... having transformed the tsar's might and fierce mind to mercy".